development of non-opioid products for postsurgical pain control, has announced negative results from its second pivotal Phase 3 clinical trial assessing the safety and efficacy of Exparel® (bupivacaine liposome injectable suspension) in intercostal nerve block for posterolateral thoracotomy. The double-blind study that randomized 180 patients with either 266mg of Exparel or placebo failed to meet primary endpoint, which is reduction of cumulative pain scores over 72 hours. The U.S. Food and Drug Administration (FDA) indicated to the company at its End-of-Phase 2 Meeting that a single pivotal trial meeting its primary endpoint would be sufficient to gain approval for the nerve block indication, assuming demonstration of adequate safety. 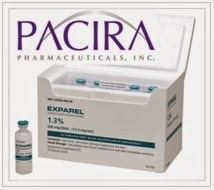 Pacira plans to submit data from the ongoing femoral nerve block study to demonstrate efficacy and safety, as well as safety data from the intercostal nerve block study with Exparel® that also has broad applications across a range of surgical specialties and is currently indicated for single-dose administration into the surgical site to produce postsurgical analgesia. The complete data set from the trial will be available in the next few weeks, and while further analyses are currently underway to better understand why patients in some countries had positive results while others had a very high placebo response, “we are pleased with the initial assessment of safety in this model,” said Dave Stack, president, chief executive officer and chairman of Pacira.